Water is, perhaps, the most important material known to humankind, supporting life in its myriad forms. Water interfaces are ubiquitous, from interfaces that we observe everyday when we drink from a glass of water, such as those between water and vapor, or water and glass, to the large surfaces of lakes and oceans, as well as the microscopic internal interfaces within bulk water that are formed by self-assembling molecular structures. Understanding the behavior of water at interfaces – from those of small solutes to biomolecules and polymers to inorganic materials and metals – holds the key to understanding disparate phenomena from self-assembly to bio-fouling, and catalysis to corrosion. Water purification, the extraction of rare earth metals, and protein interactions that perform the functions of life all rely on the distinctive behavior of water at interfaces. Mark’s group investigates fundamental and applied aspects of water interfaces, with a recent emphasis on phenomena at the interfaces between water and organic fluids. These include electrified interfaces, voltage-tunable nanoparticle assemblies, the behavior of inorganic and organic ions at interfaces, and protein interactions with lipid assemblies that mimic biomembranes. Mark’s group is housed in a Department of Physics, but also draws upon their knowledge of chemistry, as well as collaborations with chemists, chemical engineers, and others, to study these interfaces. Mark’s group uses X-ray scattering and other techniques to provide a physical description of molecular-level processes at water surfaces and interfaces, with a more recent emphasis on understanding the role of electrostatics in these processes. This has led to a new understanding of the distribution of ions at interfaces, including the role of ion correlations and interfacial structure in determining them. Such distributions underlie the equilibrium and dynamical properties of charged molecules and particles at interfaces and in bulk solution. Ion distributions are relevant to many scientific and industrial processes, including areas of societal relevance such as water treatment and purification. Recent research in Mark’s group includes a fundamental understanding of extractant-assisted ion transfer, which is relevant for environmental remediation, water cleanup, and heavy metal separations. A relatively new area of research in Mark’s group is the voltage-controlled localization and assembly of charged nanoparticles at water-organic interfaces. Other areas of interest include the study of protein interactions with aqueous hydrophilic surfaces, such as membranes, surfactant ordering and interactions at water surfaces and interfaces, and nanoscale aqueous films. The majority of this research is experimental, though theory and simulations have been developed in support of the experiments. Mark published a book with Peter Pershan of Harvard University that examines the surfaces of bulk liquids, thin wetting films, and buried liquid-liquid interfaces. 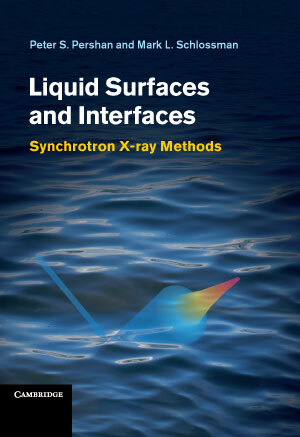 It discusses experiments on simple and complex fluids, including pure water and organic liquids, liquid crystals, liquid metals, electrified liquid-liquid interfaces and interfacial monolayers of amphiphiles, nanoparticles, polymers and biomolecules. The apparatus and techniques used for experiments, as well as theoretical approaches to data analysis, are described.